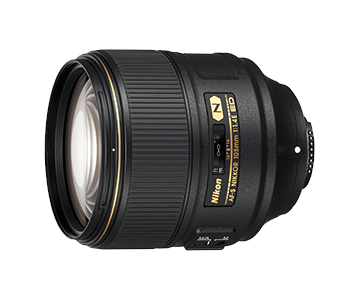 As the worlds first*1 autofocus lens with a focal length of 105mm and an aperture of f/1.4, the FX-format AF-S NIKKOR 105mm f/1.4E ED brings innovation to advance the boundaries of imaging excellence. Revel in the AF-S NIKKOR 105mm f/1.4E EDs superior optical performance that delivers high resolution across the entire frame for dramatically sharp images that are rich in detail. The 105mm focal length*2 and fast f/1.4 maximum aperture ensures evenly lit and high-contrast images even from a distance, making it a versatile performer for indoor portraits, intimate weddings, and outdoor nightscapes. Its three Extra-low Dispersion glass elements and Nano Crystal Coat optimise sharpness and contrast, while fluorine coat ensures easy maintenance and lens durability. Crafted to produce natural and beautiful bokeh, it is the ultimate lens for exceptional portrait and street photography. Designed to excel under the most challenging lighting conditions, the AF-S NIKKOR 105mm f/1.4E ED is capable of focusing quickly for superb images in low-light. With f/1.4 maximum aperture, you can shoot at faster shutter speeds under low-light conditions and capture remarkably sharp images, while the responsive electromagnetic diaphragm mechanism ensures stable auto-exposure control even during high-speed continuous shooting. This results in images that are outstandingly crisp and vivid even in low-light situations within buildings and dimly-lit rooms. Add a dramatic sense of depth to your compositions with the AF-S NIKKOR 105mm f/1.4E ED. The ultra-fast portrait lens attains amazingly high resolution across the entire frame including the peripheral areas with sharp and clear rendering at the centre. Superior optical performance is achieved through NIKKOR¡¯s unique ¡°three-dimensional high-fidelity¡± design concept, allowing for smooth and beautiful bokeh with gradual alteration from the focus planes and a natural depth of field. The nine-blade rounded diaphragm creates a smooth and rounded bokeh, while the enhanced depth of field delivers images that truly stand out. Enjoy the freedom to capture sharp and vibrant images even under harsh and bright lighting conditions. Engineered with three Extra-low Dispersion glass elements that reduce chromatic aberration to enhance sharpness and contrast, and Nano Crystal Coat to minimise ghosting and flare, the AF-S NIKKOR 105mm f/1.4E ED resolves portraits, landscapes, and even night sceneries with unmatched colour balance and picture details. A fluorine coating is applied to the extreme front and rear lens surfaces for extra durability to repel dust, water droplets, grease, and dirt for easy maintenance no matter where your photographic journey takes you.